Please sign our Petition! / Veuillez signer notre pétition! A private member’s bill called The “Unborn Victims of Crime Act” (C-484) has been introduced by Conservative MP Ken Epp (Edmonton Sherwood Park). It had its first hour of debate in Parliament on December 13, and is projected to come up for its second hour of debate on February 29, with a vote on March 5. The text of the bill is here: http://www2.parl.gc.ca/HousePublications/Publication.aspx?Docid=3127600&file=4. The bill would amend the Criminal Code to allow separate homicide charges to be laid in the death of a fetus when a pregnant woman is attacked. If passed, this bill would be an unconstitutional infringement on women’s rights, and would likely result in harms against pregnant women. It is a key step towards re-criminalizing abortion, but it could also criminalize pregnant women for behaviours perceived to harm their fetuses. Info: This is your official invitation to Beyond Pink 2008, the premier conference of the Young Women in Business (YWiB) Network! Beyond Pink is the first conference of its kind in Western Canada and will act as the launch event for YWiB in March 2008. This two-day event will focus on personal and professional development, and feature an interactive workshop series, extraordinary speaker and panel sessions, the Connect! Women in Business Tradeshow, a mentorship lunch, and a celebratory gala dinner. Our goal is that delegates will walk away from the weekend inspired with the knowledge, will, and skill to pursue their passions. Beyond Pink will appeal to ambitious, positive, and forward-thinking young women from all backgrounds and industries. Dreams for Women… THE MOVIE!!! The brilliant Kelly Lau, the project coordinator for Dreams for Women has made a fabulous video to promote the program. I thought I would share it with you! Distribute it widely! Yes, I know! We here at Antigone have sort of sucked the last few weeks in regards to posting. That’s because we’ve been working on some cool things that hopefully will come to pass in the next few weeks. But I thought that I should definitely blog today… especially since Kristof wrote an interesting article in the New York Times about discrimination that still faces women in politics. The most interesting part was where he cited studies that show how women and men are evaluated differently. 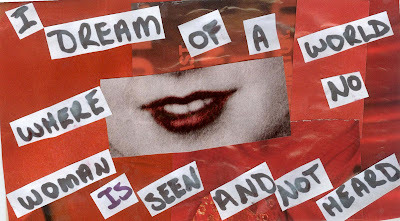 Antigone Magazine is launching a Feminist Postcard art project and fundraiser but instead of asking what your secrets are, we want to know what your Dreams for Women are. With your postcard submission, we ask that you make a donation (if you can!) to Antigone Magazine for anywhere from $1 to $10. You can send your money along with your postcard or donate on our blog. But don’t worry… if you don’t have the money, just send along the postcard and tell people about this program. We will be posting postcards every second Saturday starting in January!